We’ve been to Hawaii many times, and never to Oahu. On the way to Kauai or other Hawaiian Islands, we’ve flown through the Honolulu Airport but never actually stayed there. Recently, Ava and I had the chance to visit Oahu and found the best family fun activities in Honolulu. Turns out there are a ton of cool things to do there, and we’ve been missing out by not visiting Oahu before. We hit the sand as soon as we arrived at the Hilton Hawaiian Village in Waikiki. To be honest, Ava is obsessed with the TV show Hawaii 5-0 and has been begging to visit Honolulu for some time. We’ve been reluctant because it seemed very touristy and crowded, and maybe not the chill experience we like about Hawaii. Yes it is the capital of Hawaii and a city of some 350,000 people, but does not seem crowded by any means. Plus there is the OG Hawaii vibe the whole place exudes, and plenty of history to back that up. And of course, the Hawaii 5-0 cast adds some Hollywood glamour. Up until now, Kauai has been our Hawaiian destination of choice. 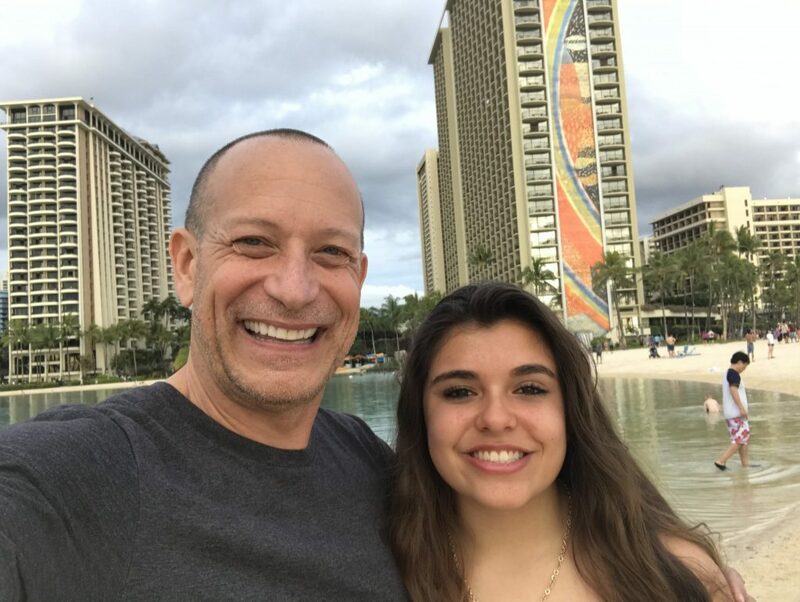 But Ava and I had so much fun in Oahu, we are happy to share some of the best family fun activities in Honolulu. Although we were only there a couple of days, we really packed in a lot of action. Here’s some things you simply cannot miss when visiting Honolulu with kids. There’s a reason Waikiki Beach is so famous the world over. Wide beaches, epic waves and warm water make this an ideal location for some surf and sand. From the lagoon at the Hilton Hawaiian Village all the way to the slopes of Diamond Head, this enormous stretch of beach offers gorgeous views from every location. In many places, you can just plop down in the sand and let the warm Hawaiian sun relax you. If you like, you can rent a beach chair and umbrella for extra comfort. Or if you are feeling active, there are plenty of places to rent a surf board and paddle out for a quick lesson. 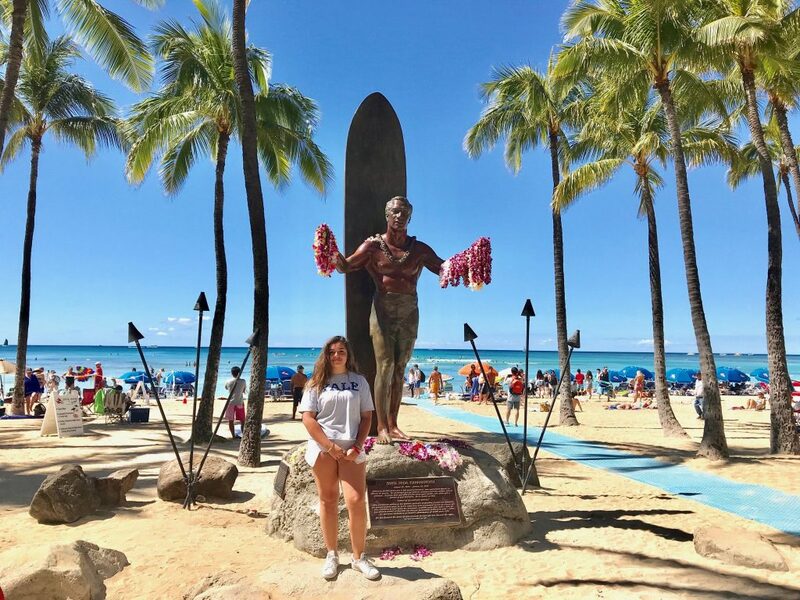 Ava got a great pose shot with the statue of Duke Kahanamoku on Waikiki Beach. Right in the center of town, we visited the famous statue of Kahanamoku. Known as the inventor of modern surfing, Duke is a local hero much loved for making the sport so popular. Visitors even make pilgrimages to the statue, draping flower leis on Duke’s arms and at his feet in homage. Nearby, a juice hut serves up some delicious fresh pineapple and coconut umbrella drinks. We sat on the seawall, taking in the views and slurping on our tropical concoctions. It was bliss. 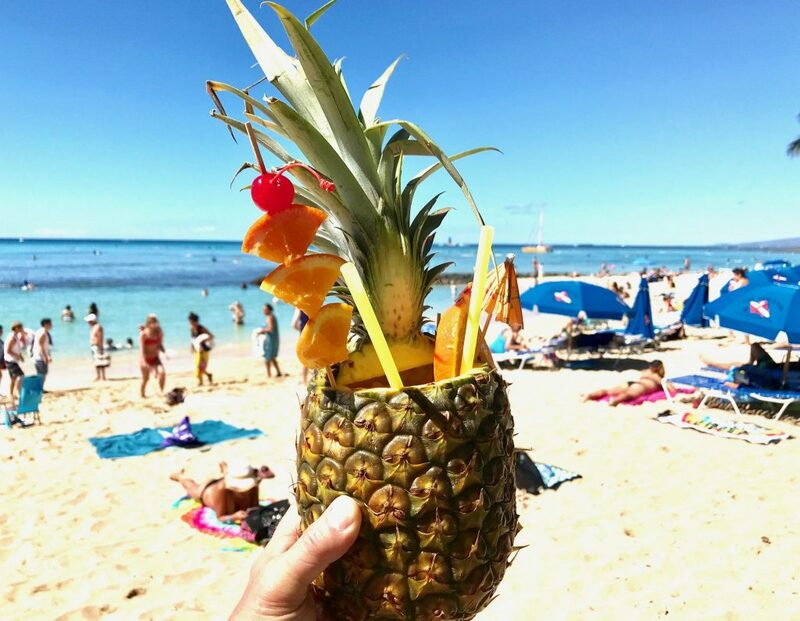 Fresh fruit drinks are always better served in a Hawaiian pineapple. We’ve had some amazing experiences with sea turtles in different places around the world, and even got to release baby turtles into the surf in Puerto Vallarta. But here in Waikiki, we got to snorkel with the sea turtles right off the coast of Waikiki Beach. Boarding a catamaran at dock in front of our hotel right on Waikiki Beach (Hilton Hawaiian Village), we settled into our seats in the warm sun aboard the “Spirit of Aloha” Catamaran for our snorkel sail. The boat quickly scooted out beyond the wave break and plunked down anchor. Donning our snorkel equipment with about 15 other guests, we jumped into the warm water. The sea life was right beneath us – schools of brightly colored tropical fish swam casually by. Bright yellows, cobalt blues, oranges and purples were all represented as fishes of many varieties went about their business. 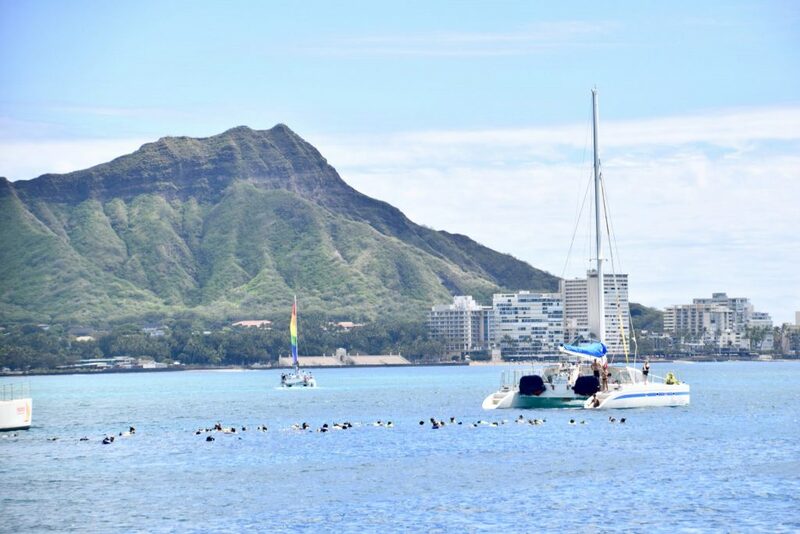 With Diamond Head in the distance, snorkeling in Waikiki is pretty awesome. Near a collection of coral and rocks nearby, a collection of sea turtles were hanging out just a few feet below the surface. As we swam over, they stayed put as though mesmerized by the swaying ocean waters. In fact, they had come to this spot to be cleaned! The turtles know that certain fish hang out here – fish that clean the seaweed, barnacles and other stuff that sticks to the turtles’ shells. Completely relaxed, the turtles hang out while the fish eat up all the gunk. We got to watch them and even dive down to say hello (just not to close as to bother them or the fish!) It was an experience like no other turtle encounter. 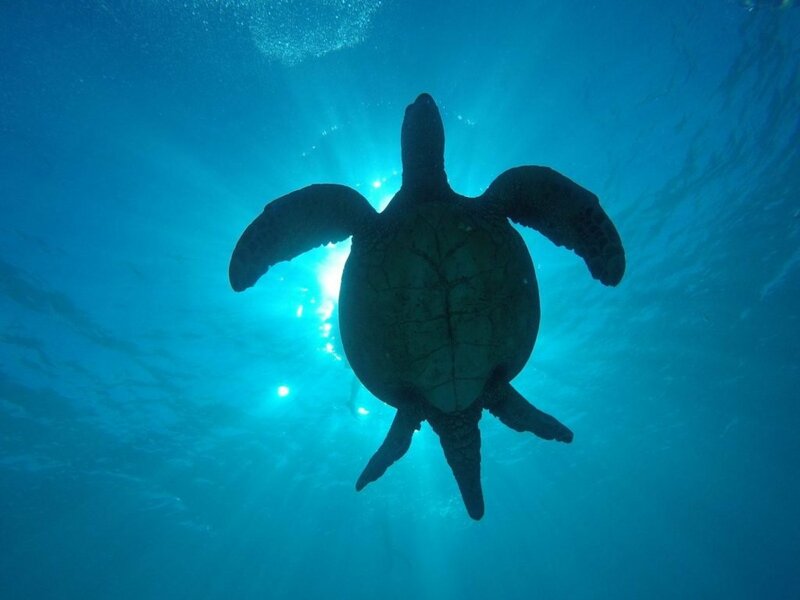 Snorkeling with the sea turtles in Honolulu was so peaceful. Honestly one of the funnest things we’ve done in a long time, the electric bikes at Pedego Waikiki are a blast! 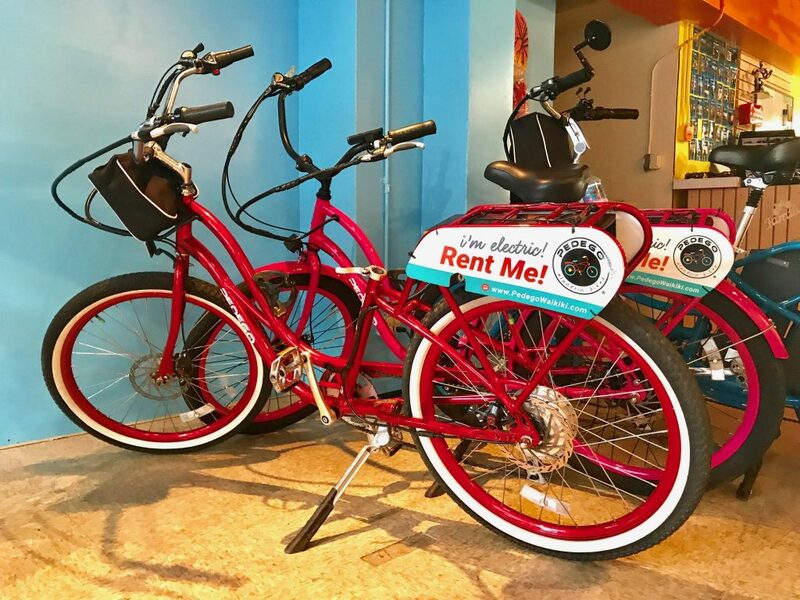 Located centrally in the downtown district, Pedego Waikiki utilizes a fleet of Pedego battery-powered bikes. With both pedal-assist and a throttle for extra power, these rental bikes allowed us to choose how hard we wanted to work. The pedals had five speeds, and even at the lowest speed we cruised along at a nice pace. Ava did not want to pedal much, and once she got the hang of the throttle she was zipping right along. Trying to get a little workout in, I pedaled more (except when we came to the hills)! And for families with littles, they even have bikes with extra seats, trailers and more to accommodate the entire clan. 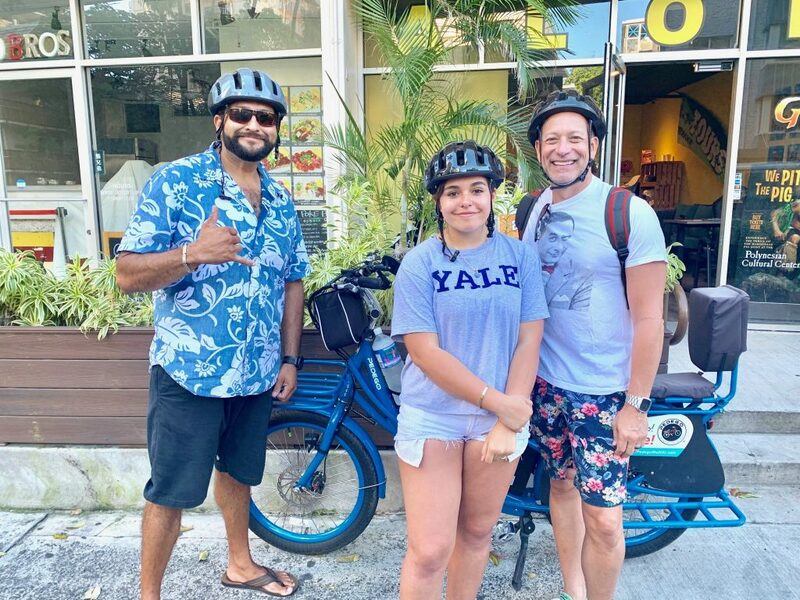 Getting ready to embark on our epic bike ride to tour Honolulu with Pedego Waikiki. As for the tour, it was just spectacular. We lucked out, and our guide Michael is also the owner of Pedego Waikiki with his wife Suzanne. Our tour of Honolulu was extensive, and we rode along the Ala Wai Canal and over to the Magic Island near the Hilton Hawaiian Village. From there we rode towards Pearl Harbor all the way past the tour boat marina. After tooling through a sweet waterfront park, we rode down through an artsy warehouse district with enormous and colorful murals painted on the sides of buildings. Heading back the other direction, we rode along Waikiki Beach and over to Diamond Head. The lookout at Diamond Head has some of the most gorgeous views of Honolulu and Waikiki, and we sat amazed at the beauty of this city. After zipping down the other side, we rode around the back of the crater and ended up back where we started. It was more than three hours of enormous fun, and we would do it again in a heartbeat! The electric bikes at Pedego Waikiki are so fun and colorful. What’s Hawaii without a luau?!? Since we were there with a group, we all headed to the Waikiki Starlight Luau. Billed as the only outdoor luau under the stars in Honolulu, this venue did not disappoint. We’ve been to a few luaus in our time, and this one was probably the most relaxed and fun show. Performers came into the audience several times and drew guests up on stage to participate, and it wasn’t awkward. I even got pulled up to blow the official luau greeting on a giant conch shell – it was fun. The make hula dancers at the Waikiki Starlight Luau were just as good as the ladies. Another thing we liked about this luau was the choice of food, and the buffet had something for everybody. Even the bar was generous with their pours, so everyone was very happy. The dancer themselves were very entertaining, and the seemed like they were genuinely enjoying themselves. Kidding with each other and being playful, they made it fun for us to watch. It was more than a hula demonstration. 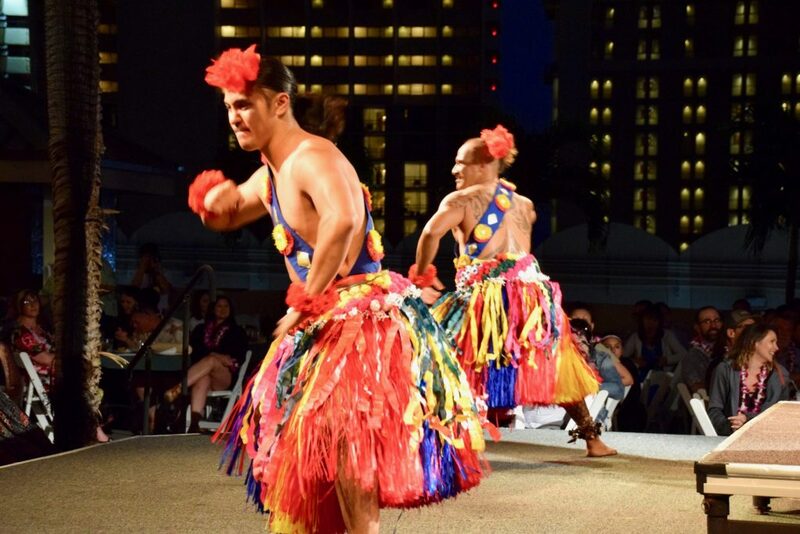 Dances from all the Polynesian Islands were represented – even acrobatic fire dancers. One of the most moving experiences on our trip to Honolulu was our visit to Pearl Harbor. The Pearl Harbor Historic Sites are open free to the public, and there is plenty to see and experience here. Don’t miss the short film that tells the story of what happened here and why. I’ve grown up hearing about Pearl Harbor, and I did not remember many of the things that led to this horrendous day on December 7, 1941. 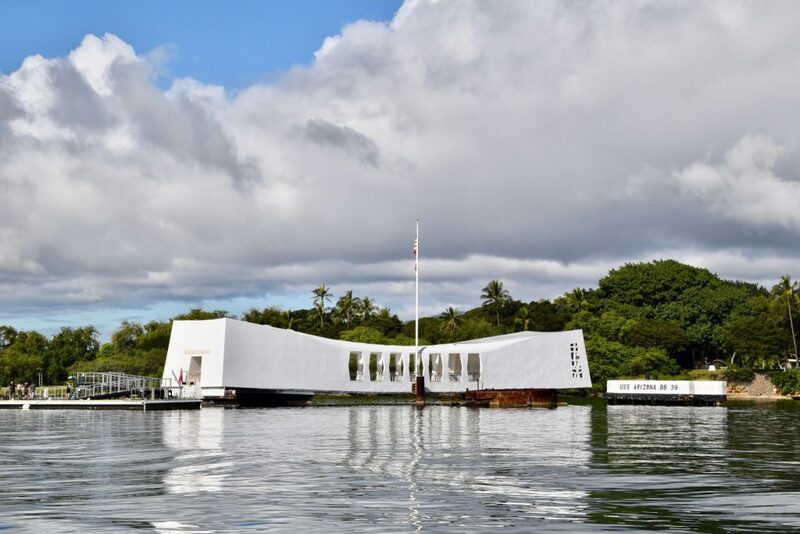 The USS Arizona Memorial spans the width of the battleship’s bridge. The USS Arizona Memorial is really dramatic. Although the Memorial building itself was being renovated and we could not board it, we still toured around it by boat and saw the hulking deck of the Arizona submerged just beneath the water. This Memorial is also a tomb to hundreds of servicemen that died aboard the ship and are still beneath her decks. For a small fee, another area allowed us to board the USS Bowfin submarine and go below decks to crawl through the tight quarters. We got a glimpse of what life onboard a submarine was like, and let me tell you it was cramped! As in TINY. I think I would have gone insane down there! Still, it was super cool to see the torpedo chambers and living quarters and even the control room. 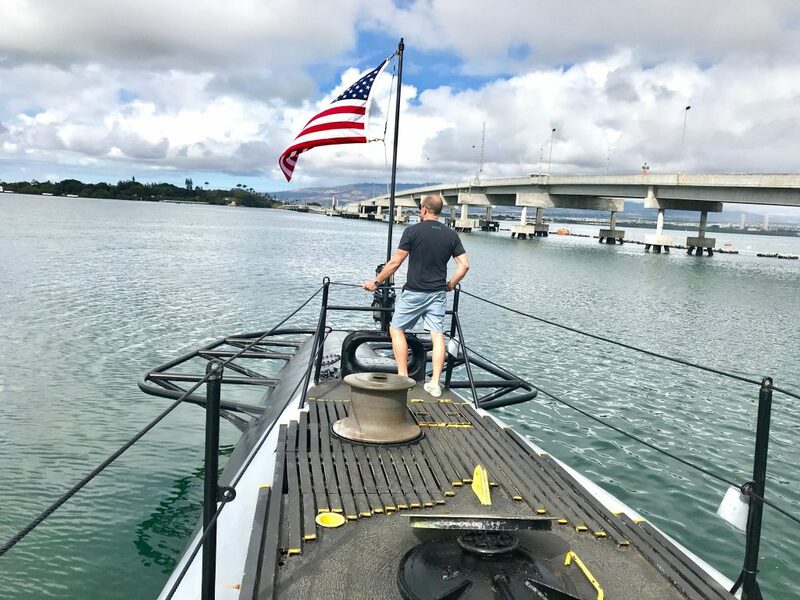 Standing on the deck of the USS Bowfin submarine overlooking Pearl Harbor. We wished we had allowed for more time, because we would have liked to ride the tram over to the USS Missouri. This ship is fully intact, moored at Ford Island in its original outfittings so visitors can board and see what a World War II battleship was really like. 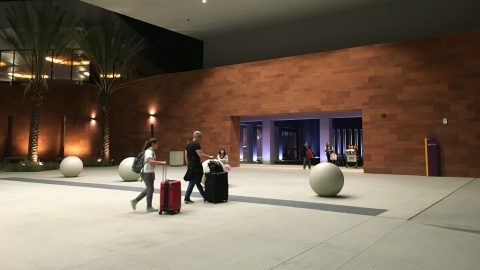 Definitely a reason to go back. Last but not least, right before we left for the airport to come home we stopped for pearls at Maui Divers. 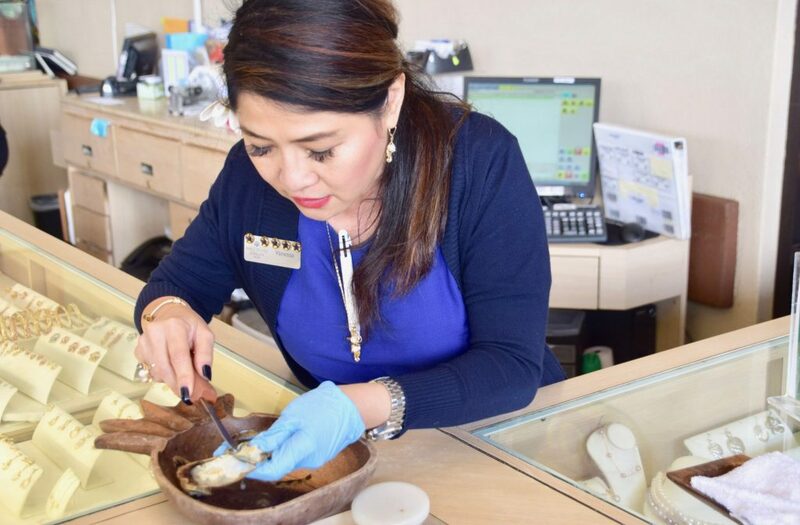 They have several locations around Honolulu where you can choose an oyster to get a pearl. For real, they have live oysters in a giant bowl of seawater and for a fee you can choose one. Our nice attendant shucked the oyster to reveal the pearl, and Ava’s was pink. We chose another one to bring home for Sophia, and hers was a beautiful lavendar/black. Because we were so nice (and probably looked like spenders) she gave us a third oyster to open, and this one had twin black pearls! Ava used special tongs to choose her oyster to unveil its pearl. From an array of mounts, we choose a ring for Ava’s pink pearl and a necklace for Sophia’s black pearl. The twin black pearls were mounted into stud earrings. 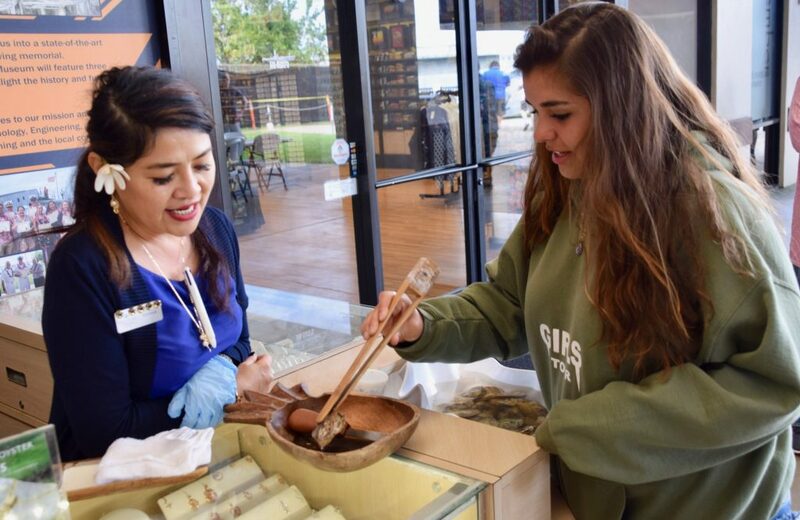 It was a fun way to shop for a memento from Hawaii to bring back home to the Mainland. Vanessa shucks Ava’s oyster to reveal her pearl. This turned out to be quite an amazing trip. 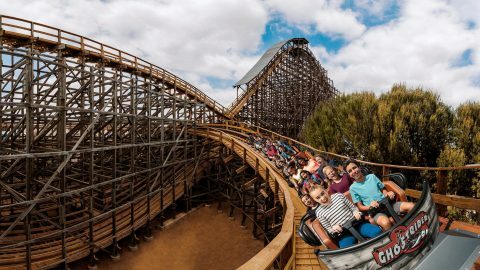 We discovered many cool things for our list of best family fun activities in Honolulu, yet we are sure there are a ton more. What did we miss? Any ideas to add for the next time we go to Honolulu? Share with us please! 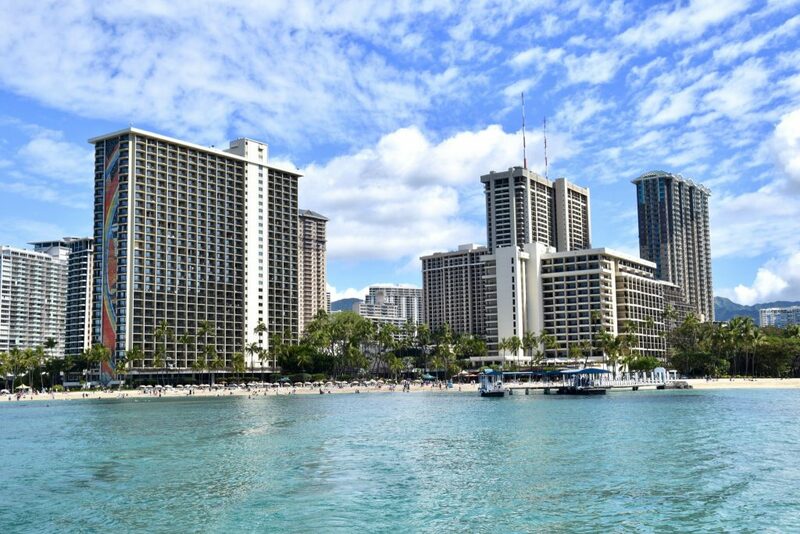 The Hilton Hawaiian Village is a multi-faceted resort sitting right on the sand at Waikiki Beach.